Another year, another ice out date. 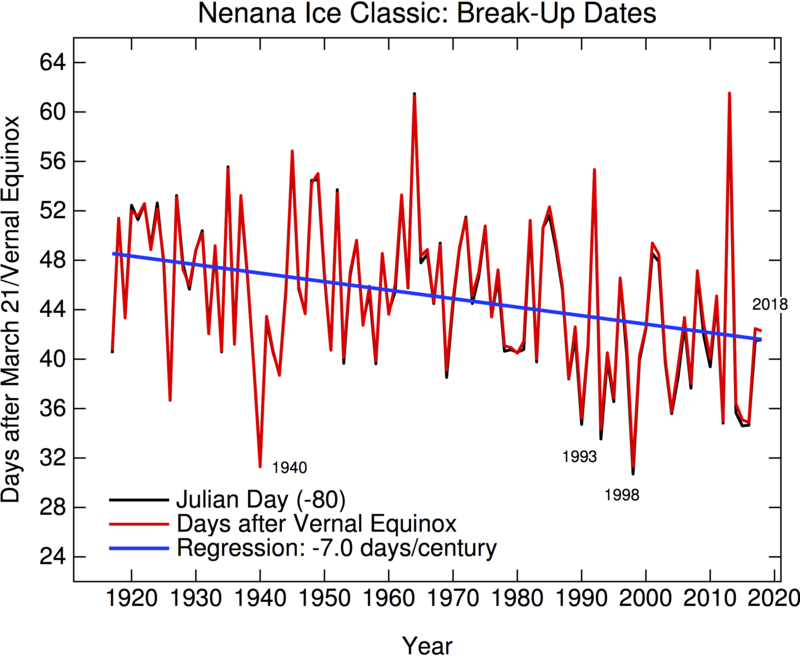 As in previous years, here’s an update of the Nenana Ice Classic time series (raw date, and then with a small adjustment for the calendrical variations in ‘spring’). One time series doesn’t prove much, but this is of course part of a much larger archive of phenomenological climate-related data that I’ve talked about before. This year the ice on the Tanana River went out on May 1st, oddly enough the same date as last year, after another very warm (but quite snowy) Alaskan winter. The responses to the last post on the Rideau Canal Skateway season changes were interesting, and led to a few pointers to additional data sets that show similar trends and some rather odd counter-points from the usual suspects. This is a thread to discuss the surface temperature records that were all released yesterday (Jan 18). There is far too much data-vizualization on this to link to, but feel free to do so in the comments. Bottom line? It’s still getting warmer. Millar et al’s recent paper in Nature Geoscience has provoked a lot of lively discussion, with the authors of the original paper releasing a statement to clarify that their paper did not suggest that “action to reduce greenhouse gas emissions is no longer urgent“, rather that 1.5ºC (above the pre-industrial) is not “geophysically impossible”. The range of post-2014 allowable emissions for a 66% chance of not passing 1.5ºC in Millar et al of 200-240GtC implies that the planet would exceed the threshold after 2030 at current emissions levels, compared with the AR5 analysis which would imply most likely exceedance before 2020. Assuming the Millar numbers are correct changes 1.5ºC from fantasy to merely very difficult. It’s often been said that while we can only gather new data about the planet at the rate of one year per year, rescuing old data can add far more data more quickly. Data rescue is however extremely labor intensive. Nonetheless there are multiple data rescue projects and citizen science efforts ongoing, some of which we have highlighted here before. For those looking for an intro into the subject, this 2014 article is an great introduction. 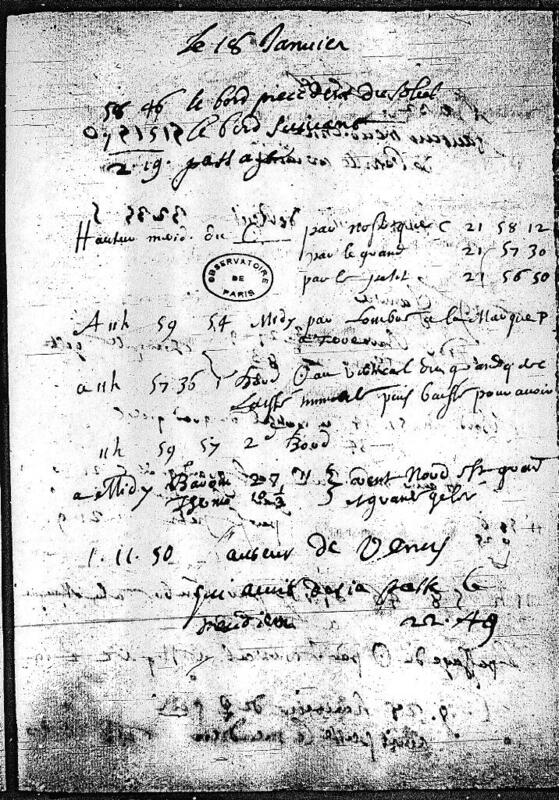 Weather diary from the the Observatoire de Paris, written by Giovanni Cassini on 18th January 1789. (If you know of any more, please add them in the comments, and I’ll try and keep this list up to date). Two recent papers help bridge a seeming gap between estimates of climate sensitivity from models and from observations of the global energy budget. Recognizing that equilibrium climate sensitivity cannot be directly observed because Earth’s energy balance is a long way from equilibrium, the studies instead focus on what can be inferred about climate sensitivity from historical trends. Calculating a climate sensitivity from the simulations that is directly comparable with that observed shows both are consistent. 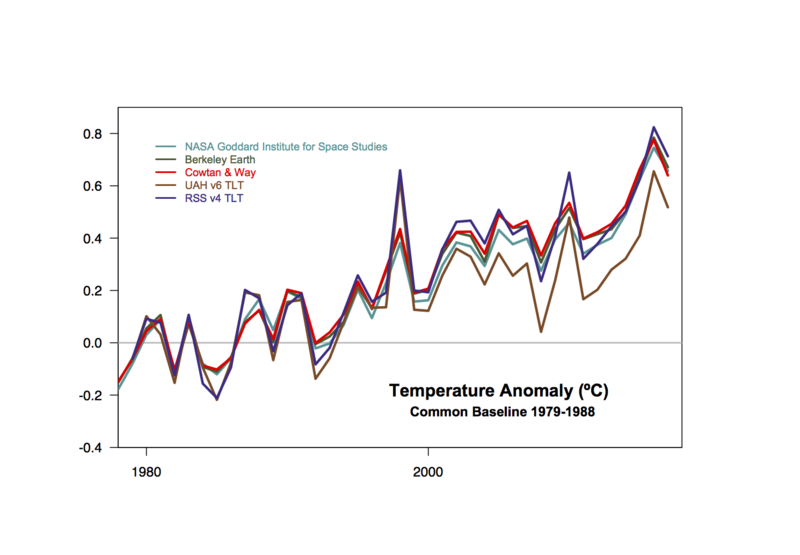 Crucial questions remain, however, regarding how climate sensitivity will evolve in the future.